Surf tours include scenic drives, activities, and surfing at the best locations on Oahu’s North Shore or East Side, all guided by our experienced surf instructors! Ideal for all abilities, from individual surfers to families, our surf tours may be booked as a full day or half day excursion, and can be fully customized to include a wide range of activities, from snorkeling and sightseeing to hiking and more. Book Full Day Surf and sightsee on Oahu’s world-famous North Shore! With an incredible range of surf spots for all levels, you’ll spend a minimum of 2 hours in the water. Book Half Day With pristine beaches and sightseeing opportunities, Oahu’s East Side is an ideal half-day adventure with a wide variety of surf spots for all abilities. The exact surfing, sightseeing, and activity locations will vary depending on whether you choose a full day (North Shore) or half day (East Side) surf tour, and on what activities you would like to include in addition to surfing. These are fully customizable tours, with flexibility to ensure you’re surfing at the best locations and checking out the sights you want to see! You will be able to indicate your surfing level/experience when booking online; this helps us choose the ideal surf locations for your full day or half day tour. Full day surf safaris begin at 8am. Half day surf safaris may begin at 8am or at 12pm. In many cases, we are able to accommodate different start times to best fit your schedule. You will be able to indicate your starting time preference when booking a surf tour online. 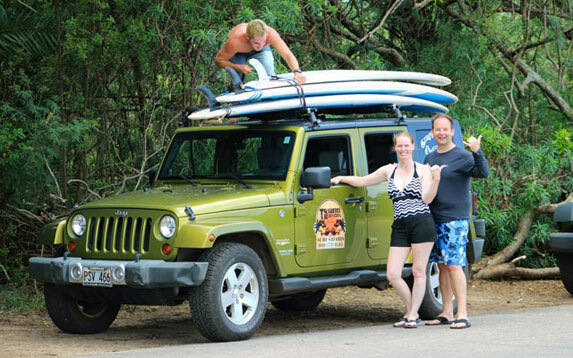 Our instructors will also be your drivers and guides for any surf tour you choose! Hotel pickup is included, but is optional if you would prefer to meet at our shop. We’ll take care of the driving in comfortable, air-conditioned transport. We’ll provide the equipment – surfboards, rashguards, light snacks, water, and anything else we’ll need for your full day or half day tour. You are welcome to bring your own surfboards, rashguards, and any other gear you’d like to have with you. When booking online, you’ll be able to request the types of activities you’d like on your itinerary. We’re also happy to make recommendations so that you get the most out of your adventure! Video and/or photos are 100% optional and are not included with the price of surf tours. Our 83 East videographers can shoot full and half day surf tours. Please note that video/photos for surf tours MUST be ordered at the time of booking. An 83 East videographer will only accompany your surf tour if you have confirmed and purchased video/photos in advance. You will be able to request video/photos when booking online. Any surf tour can be booked as an SUP tour, if you’d prefer to stand up paddle! All of the same information and rates above apply when substituting SUP for surfing. There is no minimum number of persons required to book a full day or half day surf tour; however, please note the individual rates above. Additional guests who would like to accompany your surf tour, but who will not be surfing, may be booked at a rate of $50 per person. Children ages 14 or younger must be accompanied by an adult on any surf tour. Surf tours booked online do not require advance payment. When booking a surf tour online, we will review your booking and contact you within 24 hours to confirm your date and time. Payment for surf tours is made upon completion of your tour. For more booking guidelines, please visit our FAQ.